The history of cufflinks, for obvious reasons, is closely linked to the development of men’s shirts. Although cufflinks can be traced back to the 1600s, they didn’t become popular until the end of the 18th century. Then shirt cuffs were held together by ribbons or buttons. Cufflinks as we know them today became common place around the middle of the 19th century. These days numerous styles are available and worn both formally and informally. At The Country Catalogue we a stock a range of country cufflinks to complete shooting outfits or compliment any country styled outfit. Shooting shirts will look even smarter when you choose from our Cartridge Cufflinks, Flat Cartridge Cufflinks or our Pheasant Cufflinks. For a gimmicky little gift, take a look at our fake cartridge case which has Cartridge Cufflinks in red hidden inside. 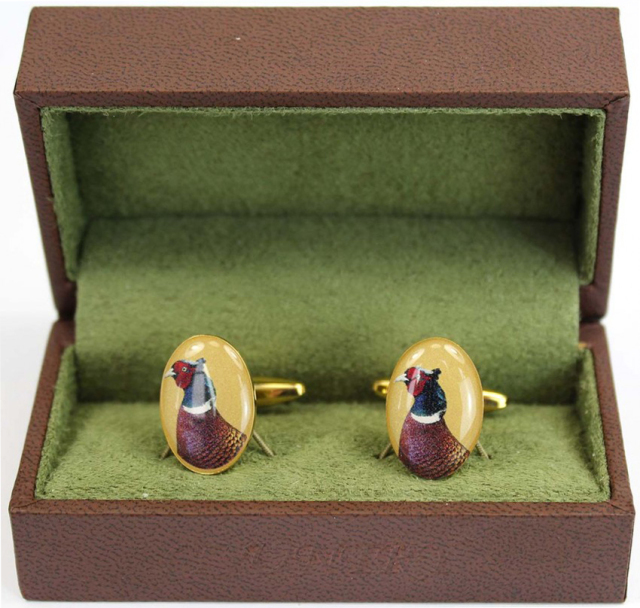 A really smart present for the shooting man is our printed silk pheasant tie & cartridge cufflinks gift box where the gift box matches the pheasant tie and also includes cufflinks. For general country outfits, we would again suggest our Pheasant Cufflinks or, for Labrador lovers, our Labrador Cufflinks feature a very smart black Labrador. Farmers will no doubt like our Tractor Cufflinks or our Fox Cufflinks feature a cunning looking fox. Whether you’re looking for cufflinks for a gift or cufflinks for yourself, all our country cufflinks and shooting cufflinks come complete with a presentation box which is equally useful as a storage box for your cufflinks.